Furniture to fill their new home…shop and car repair tools…TVs…scuba diving gear…a brand-new computer…decorative tiles…and “too many clothes” for the warm, tropical climate and their relaxed lifestyle. When Barry Munson, 60, and Dena Carey, 58, joined Belize‘s Qualified Retired Persons program five years ago, they brought a shipping container full of household goods and possessions. And it was all tax-free. It’s one of the major features of the QRP. You can also bring in a car less than three years old, a boat, or a light aircraft without paying the high import duty—a savings of thousands of dollars for most who take advantage of the perk. The retired couple is thankful they were able to bring in so much without paying taxes. “It was a considerable savings,” says Barry. Barry, an avid scuba diver and world traveler, first came to Belize 12 years ago. After traveling to the country often and exploring it from border to border, he found the sandy beach they now live on 10 years ago. They eventually settled there about five years later. Consejo Village is eight miles outside of Corozal—there you’ll find Walmart, Sam’s club, and a wide variety of restaurants. The couple live about eight miles outside Corozal in Consejo Village, in the far north of Belize near the border with Mexico. It’s a traditional fishing village set on a vast bay on the Caribbean lined by palms, forest, and quiet beaches. The area has become increasingly popular with expats thanks to a lower cost of living. You also get quick access to Mexico, which is just across the border, and the First-World shopping, medical care, and other amenities found there. 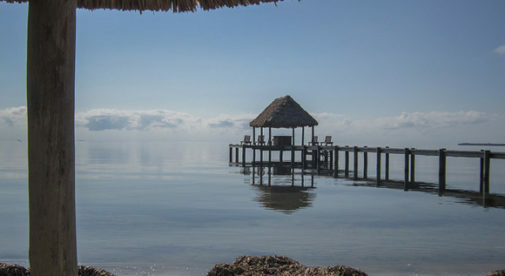 And there’s plenty to do on the Belize side of the border. 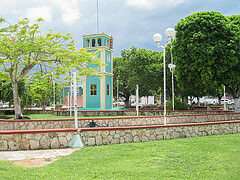 Belize being English-speaking is a major draw for retirees and other expats as well. To join the Qualified Retired Persons program, there are some basic qualifications—being officially retired isn’t one of them. To qualify, you must be at least 45 years old, spend at least a month a year in Belize, and show a monthly income of at least $2,000. Applications are processed and the program run by the Belize Tourism Board (BTB). The process to apply is easy. Barry is officially the QRP member, with Dena as his dependent. “It was a smooth process. The requirements are very clear,” says Dena.